Our top 5 picks for the best presses in 2019. What is a tofu press and how does it work? How is tofu made (this is important to understand if you're buying a press). The different types of tofu press options. An in-depth analysis of all our favorite picks. In a hurry? You can check out any one of our top five picks for top 5 best tofu press options here or continue reading for the entire buyer's guide. 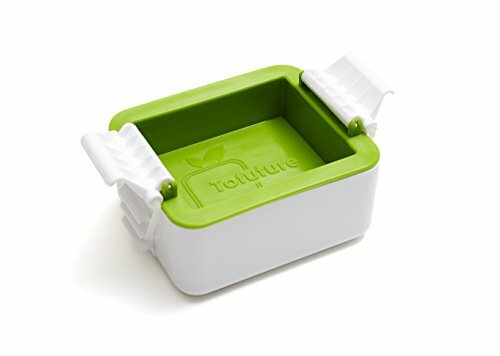 Tofuture - Our Pick for the Best Tofu Press – Neat, compact, and band adjustable press with a unique design. Super convenient because it catches the water as you drain it. This means you can start the process and stick it right in the fridge. 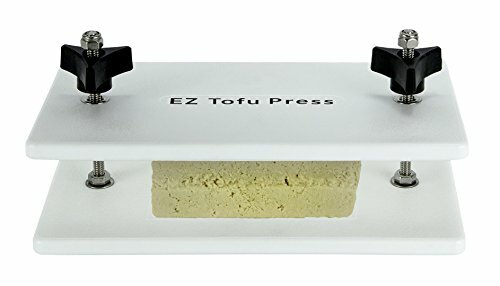 EZ Tofu Press – No frills double plated tofu press which allows you to completely adjust the tension. Can fit two blocks in, only downside is that it doesn’t have a place to catch the water. 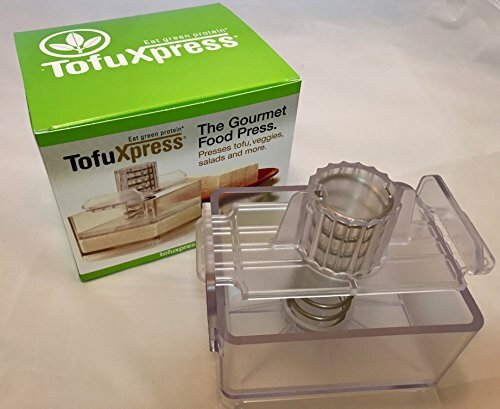 TofuXpress Tofu Press – A versatile tofu press that’s extremely easy to use. Super Tofu Press – Similar to the tofu press above, but with the added benefit of spring-loaded plates. Raw Rutes Tofu Press Ninja – Beautiful stainless steel tofu press designed to last a lifetime. Tofu is actually nothing but a block of bean curd. While most commonly made with soybeans, it can also be made from other legumes such as chickpeas. Notice that word curd is short for "curdle" which is defined as causing something to coagulate or congeal. It is simply or congealed soy milk that's been formed into a block using a coagulant. If you're not familiar with these terms, a coagulant is a substance that helps transform something from a liquid to a gel. In the case of tofu, the most common coagulant is Nagari (magnesium chloride). Although it might seem like tofu is just starting to gain popularity, the truth is that tofu has been around for a long time. The earliest known origins of the word were from 1182 in Japan, but the product itself is said to have originated in China at around 122 BC. It was also most likely discovered by accident when someone curdled a pureed soybean soup by seasoning it with Nigari and unrefined sea salt. In many Asian countries, tofu is more highly regarded than cheese, meat, and milk. Estimates from the 1980's state that there are nearly 250,000 manufacturers worldwide with the bulk of them in China and Japan. While this article isn't going into extreme detail about how to make tofu, it is important to understand the process. This will help you better understand the differences between each tofu press. As you'll see, some tofu press options are geared more towards draining excess water from store-bought tofu while others are meant for forming blocks. Making fresh soy milk - using a soy milk maker or a top reviewed blender. Separating the liquid from the pulp (or okara) of the finished product. Using a coagulant to curdle the liquid soy milk and placing it in a mold to finalize the block. The above video breaks down the process in a bit more detail if you're interested. 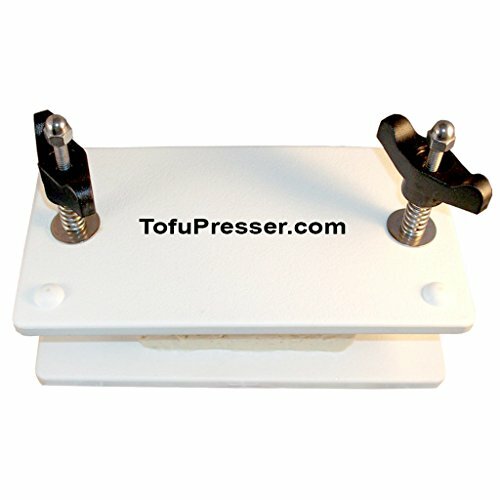 WHY BUY A TOFU PRESS? To take pre-made blocks and drain the excess water out for texture and flavor enhancement. To take coagulated bean curd and form it into a tofu block. There are different tofu press options or molds for each application. The word "press" is sometimes use interchangeably to describe both functions, but the device for the second function or more like a mold. You'd only really want to use the mold if you were making fresh at home. Note: a few of these tofu press options can be used for both molding and draining. The most common presses will greatly enhance the texture of any tofu block.In our guide on how to press and drain tofu where we found that pressed has a denser texture.This creates a more pleasant mouth-feel for some dishes, especially if you're trying to replace meat or making a feta "cheeze". Additionally, if you drain all of the water out of tofu, it allows you to re-hydrated it with flavorful marinades. Draining the flavorless excess water from blocks of tofu is really the only way to allow other seasoned liquids to make their way into the tofu. Finally, if you're trying to get your it to be crispy, pressing all of the water out as a must. Your tofu will fry to a delicious crispy texture easier, especially if you use some cornstarch, once the water is out. Tofu presses that utilize pressing plates are probably the most common types of presses on the market today.They're extremely simply to use and some are even large enough to accommodate two regular sized blocks of store-bought tofu. Pictured above is the Super Tofu Press. You unscrew the knobs on the tofu press and move the plates far enough to fit the tofu block inside. You place the product between the two plates. Tighten the knobs gradually to press the it down. Can be done in the course of 10-15 minutes or over a longer period of time. Using a single pressing plate, boxed presses operate a bit differently than the dual-plated models. Rather than having to tighten the tension on these models, the spring loaded single plate provides enough tension to drain the tofu. Pictured above is the TofuXpress Tofu Press. Place the tofu in the box directly from the package after the initial water was drained out. Secure the pressing plate onto the top of the tofu by securing the lid to the top of the base of the press. Place the press aside and prepare the rest of your meal. No need to tighten from here, you'll start seeing results at around 15 minutes, but it can be done longer. Its easy to use with very little manual work involved. 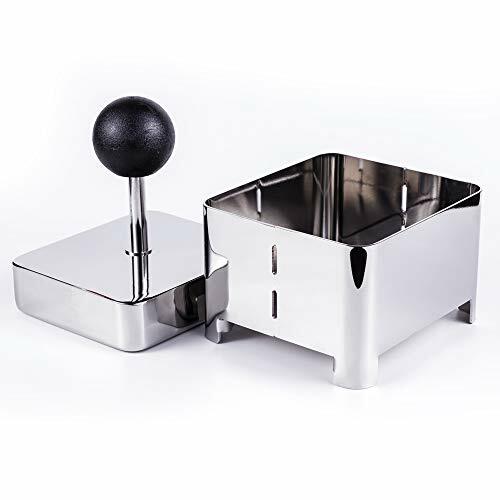 Stainless steel tofu press options are also a viable option for pressing your tofu. Rather than having any sort of spring or tension mechanism, they operate using a weighted top. The function is similar to a press you might make at home with cans or dumbbells, but is manufactured to be a lot more ergonomic and user friendly. Place the tofu within the body of the press. The weighted top will fit right on top of the tofu and press it down. No adjusting required. There's no work involved other than placing the weight. When someone is talking about a wooden or Japanese press, they are likely talking a product that also functions as a tofu mold. They function similar to a stainless steel press, except that they're wood or plastic and don't tend to come naturally weighted. Additionally, they can come in wood or plastic. You wouldn't really want to buy them to press store-bought tofu as they tend to be rather small and wouldn't be as efficient as some of the other models on this list. However, some of the best press options we've featured below can double as a tofu mold! ​Any of these best tofu press options below will get the job done. At the same time, they each have unique features, thus their own set of pros and cons. A container on the bottom to catch water. A colander-type container where the food sits. The lid of the press which has rubber bands to adjust the tension. Overall, it's a well designed and affordable compact tofu press. The adjustable tension on the model is great for pressing the product to your desired level of dryness in an even fashion. Because it comes with a container to hold the water, you don't have to worry about getting out a plate or using this tofu press in the sink. A definite plus. While it's great that you can control the tension, we've seen that the rubber bands could be a bit difficult to use. It could result in potentially slipping and dropping the unit. Comes included with a container to catch water as its being drained. Tension is adjustable with the rubber bands. You can also marinate the tofu in the same container after you drain out the water. Double functions as a mold so you can make your own tofu. Rubber band mechanism isn't the most ergonomic way to put tension onto the tofu. Slightly stressful on the fingers, but not too bad. The EZ Tofu Press is more of a budget model designed with one thing in mind: getting the water out of your blocks! While it doesn't​ have all of the bells and whistles of the TofuXpress, the EZ Tofu Press does what its designed to do. It gets the excess water very quickly as you have full control over the tension knobs. This also means that you can press down on the tofu really, really hard.​ You can press down on super firm tofu quite a bit before it starts to break apart. You can also do it really lightly if you're draining a more delicate product. It's also pretty big. We've even managed to press two blocks in ours, but it's probably better suited to press one and 3/4 blocks. A portion of the tofu was colliding with the metal screws, but that's okay! ​There is one major downside to this unit that might not be that obvious, but notice that it doesn't have anywhere for the water to go! This means that when you drain it, you need to keep it in the sink or on top of another plate. It would make a mess if you put it directly onto your counter top. All-in-all, though this is a really solid press.It's also made in the USA. ​Full control over the tension knobs means that you can press as lightly or as hard as you'd like. Big enough to fit large blocks of tofu and close to two blocks if you really stuff it in. There's not really a great place to drain the water when you're pressing it. The TofuXpress is great because of its versatility and ease of function. It has several qualities that make it stand out from the crowd. The first quality is its ability to "set it and forget it".​ Unlike some other models, there's no need to adjust the tension once you have it going. While it does prevent you from getting the tension as hard as some of the double-plated models, it also means you're not as prone to squish it (which we've done before with other models). The second reason we chose this one as the first pick is because​ it can also be used to marinate the tofu after it has been pressed. There's no reason to take out separate containers or waste plastic bags. This was a huge plus for us. Finally, the TofuXpress has the option to get a secondary lighter tension spring. You can use this lighter tension spring to make delicious items like cheese made out of soy yogurt. The design of the unit makes it far more ideal for such recipes than a double plated press. The lighter tension spring can also be used for medium firm or even silken tofu. You can even use the light tension spring as a tofu mold. If you want the lighter tension spring – please note that it is sold separately in this tofu press package. ​Easy to set it and forget it on this model. Don't have to worry about it being tight enough. Double functions as a marinating dish once the tofu is pressed. Can be used in a wide variety of other ways including making vegan yogurts. Comes with dishwasher safe parts. Can also be used as a mold. The lighter tension spring is typically sold separately. You can't adjust the tension, it just depends on the spring that you have have loaded into the press. Can only fit one block of standard store-bought tofu. Like the EZ Press, this model has full tension control and gets the excess water out of a tofu block quickly and easily. One thing you'll notice about the EZ Press is that it doesn't have any springs, only tension knobs. The Super Presser has the same basic design as the EZ Tofu Press, but actual has springs as well. These springs serve the function of preventing the plates from collapsing onto each other.​ If you've never seen either of these models in person, you can imagine how this might occur. While we've never had any issue with our EZ Press doing this, it is something to consider. We've found that once you get the tofu in, you don't really need to worry about the plates being loose anymore, but the initial set up can be a bit flimsy without the added springs. Depending on your budget as well as the current pricing of either double plated tofu press, it's probably wise to check out both these models before making your final decision. Full control tension knob with springs to keep things sturdy. This press is made in the USA. It is also top rack dishwasher safe. No good place to drain the water into, sink or additional plate will be required. We like this stainless steel press for its simplicity. The top of the press is actually a weight. All you need to do is place the tofu in and place the weight on top. This product is great because its designed to last a life time.​ Being that its stainless steel it won't absorb any odors or flavors over time and its super easy to clean. Also, some people don't want plastic touching their food - so naturally this would be their first choice. It's also got the most beautiful aesthetic on this list in our opinion. ​ If you want something that can sit directly on your counter-top then this is the model to go for. It can also be used in the final stage of the tofu making process so long as you have a cheesecloth, so it does double duty! Stainless steel parts to last a lifetime, should be the only press you ever need. Can be used as a mold in the final step of the process. No exact way to adjust the tension like some of the other units. No container so it needs to be drained over a plate or in the sink. Because all of these best tofu press options can get the job done, the final decision comes down to your person preference. Want something where you have complete control over the tension? If you want a compact unit that catches the water when you drain it go for the TofuXpress Tofu Press or the Tofuture Tofu Press.